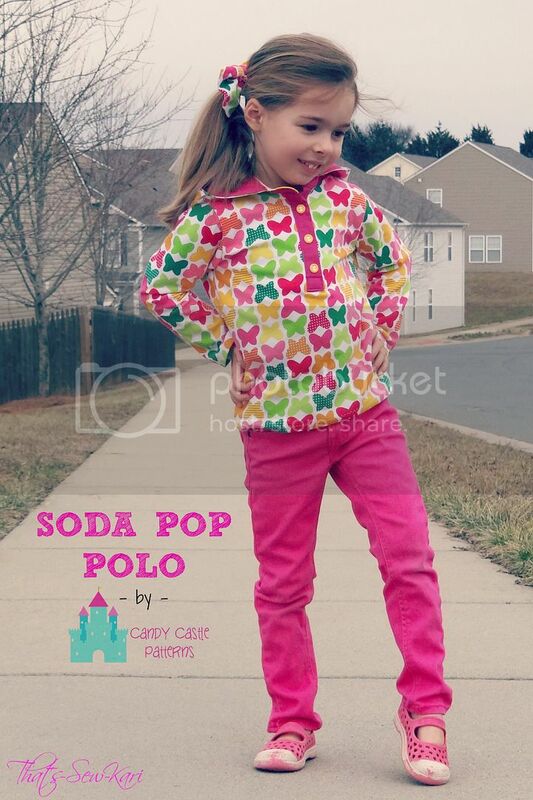 Candy Castle Patterns - The Soda Pop Polo - Finally Something for the Boys too!! 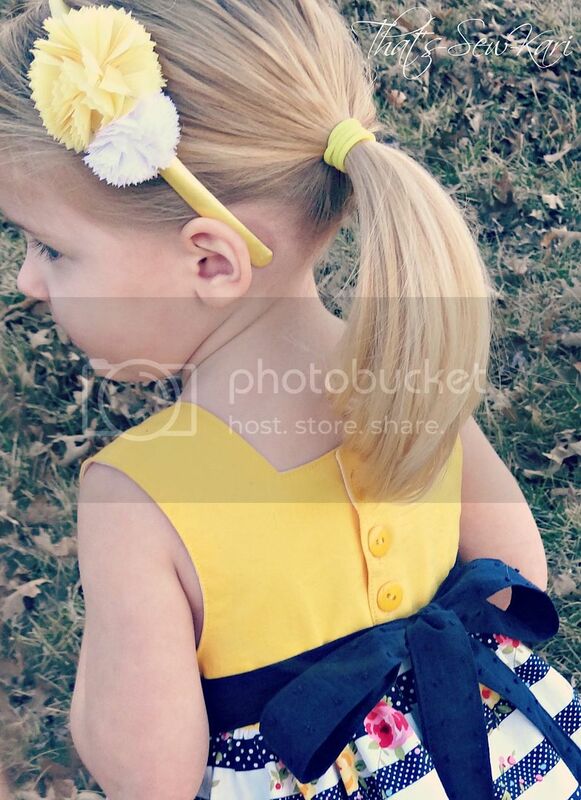 Over the last 8 months, Candy Castle Patterns has been adding pattern after pattern to her growing pattern store. 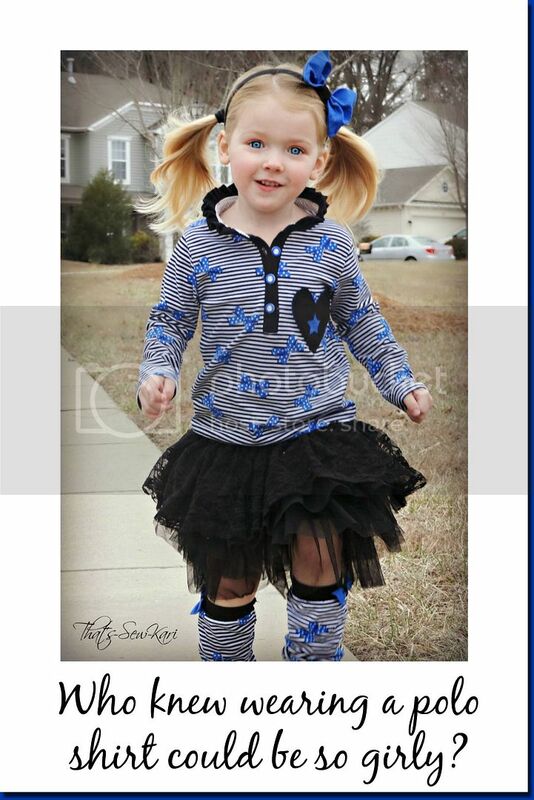 There have been amazing dresses, sweet and playful tunics and comfy, cute bloomers - all for girls... UNTIL NOW!! It's a happy day for all the CCP fans who also have sons - they finally have a pattern that appeals to them too! 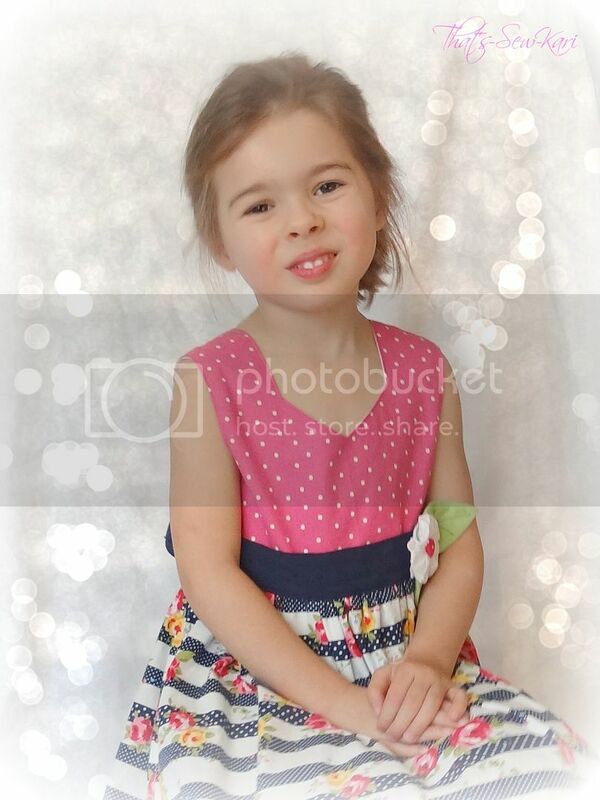 Of course, I only have two little girls so you'll be seeing some girly versions here. The Soda Pop Polo is a fun and versatile polo-style shirt that can be created so many ways. There are 4 collar options: ruffled, hooded, traditional, and henley. There are 2 sleeve lengths: short and long. There are two pocket styles, 3 reverse appliques and the list goes on! The main shirt part is knit, but so many of the fun add-ons can be made from your favorite wovens. I decided, for this test, I'd make polos to match their personalities as closely as I could. I think you'll see through pictures, that I am pretty spot-on. My girls did help me pick out their knit - which was the first time I have let them help me. And I think they did a great job! First, let's start with the Ruffle Neck version. 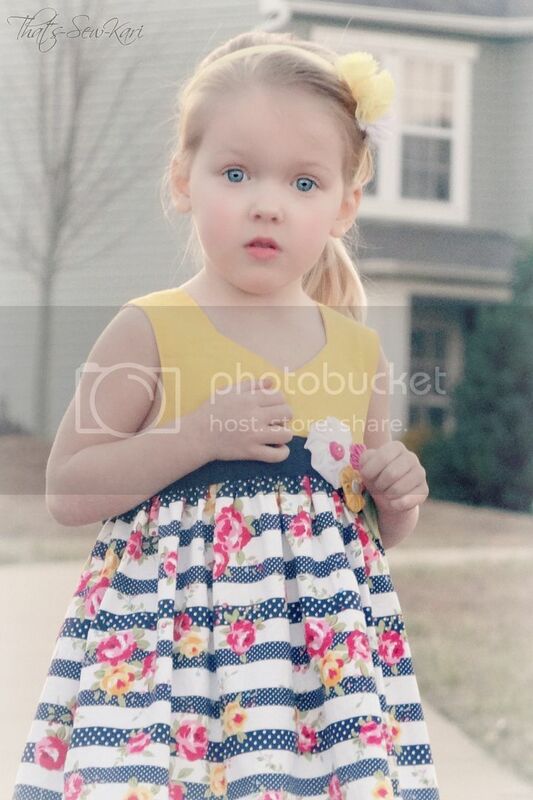 My 2 yr old is such a girly-girl. 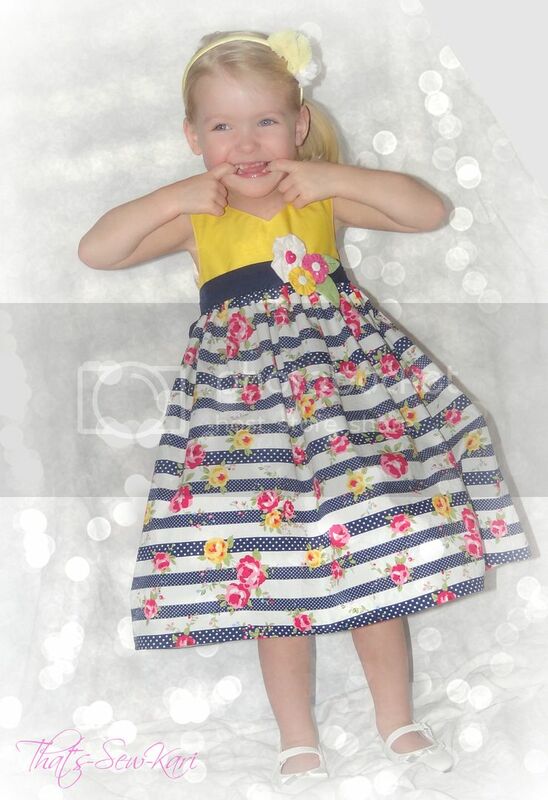 She's always dancing around like a princess, her favorite toys are her dresses and fancy shoes, and often tells people in stores, "I'm so pretty" and does a little twirl for them. Life is a song and she is definitely dancing her way through it! "Hello blogging world!! Want to see me twirl?" When my I saw this knit on Etsy at Funkalicious Fabrics, I knew it was perfect. 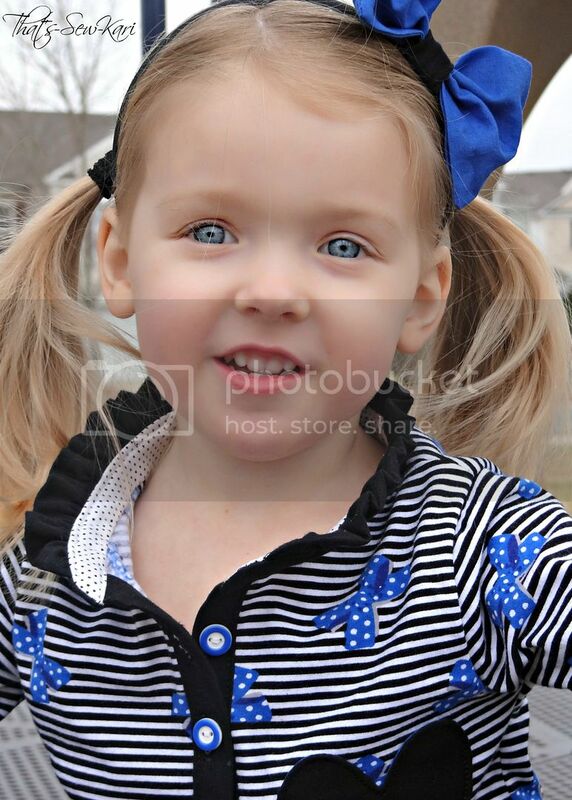 She has piercing blue eyes and I knew the royal blue bows would compliment those while the narrow black and white stripe knit would be the perfect contrast to her blonde hair. Miss 2 loved it too, as I knew she would! I used knit for 93% of this Soda Pop Polo. The only two places I chose to do woven were: the inside collar stand (white with black pin dots) and the royal blue reverse applique on the heart-shaped pocket. I originally bought blue star buttons, but found these buttons in my stash that complimented the shirt so much better. Life is more fun when you twirl your way through! I paired the shirt with a super-frilly, all lace tutu-style skirt (thanks, Santa!) 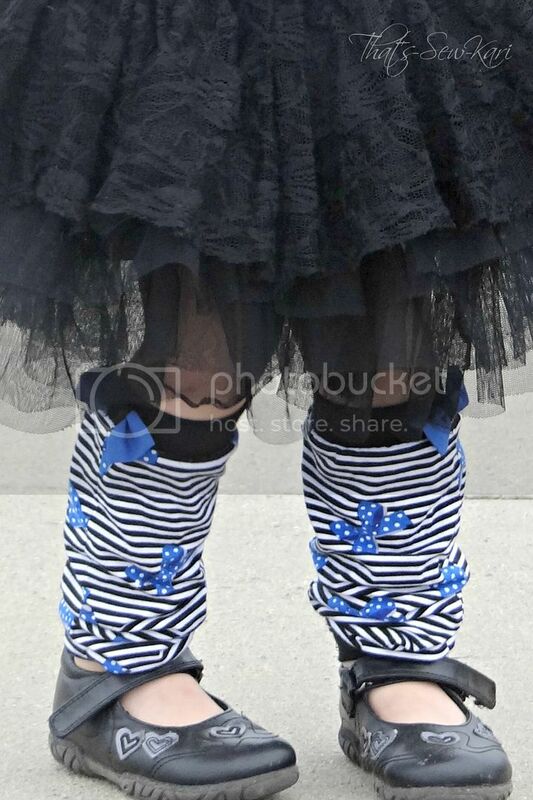 and used some of my leftover scraps to make a set of matching Licorice Bits Legwarmers (also by Candy Castle Patterns) and a super easy bow to slide onto her black headband. Moving on to the Hooded version. 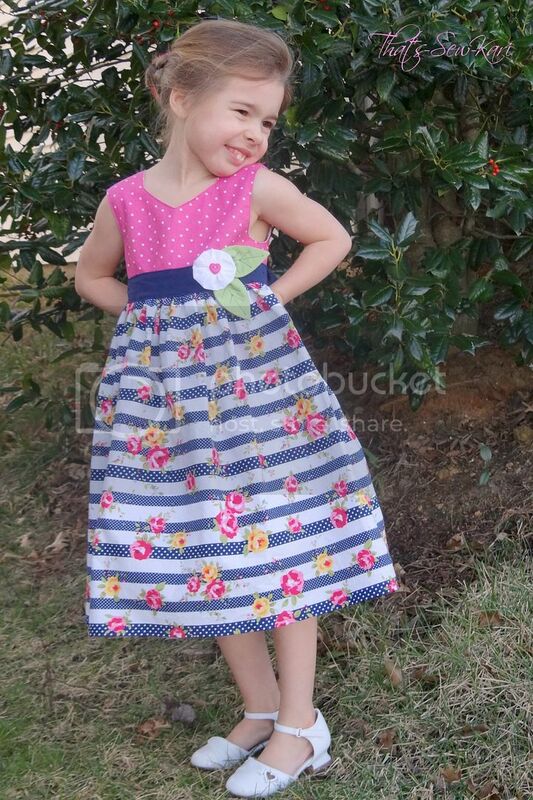 Of course, you don't have to have a ruffle-loving girly-girl to get some use out of this pattern! 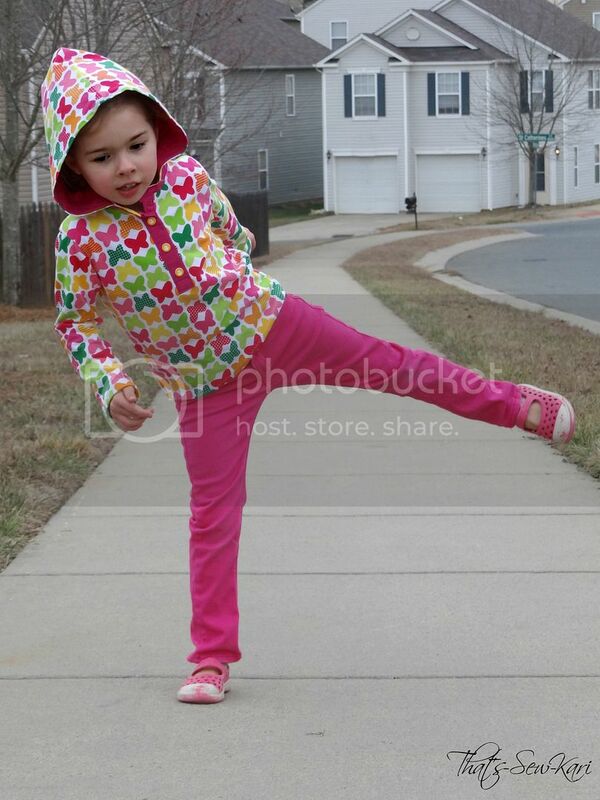 My 4 year old, while she likes to occasionally indulge in her feminine side, is much more sporty. 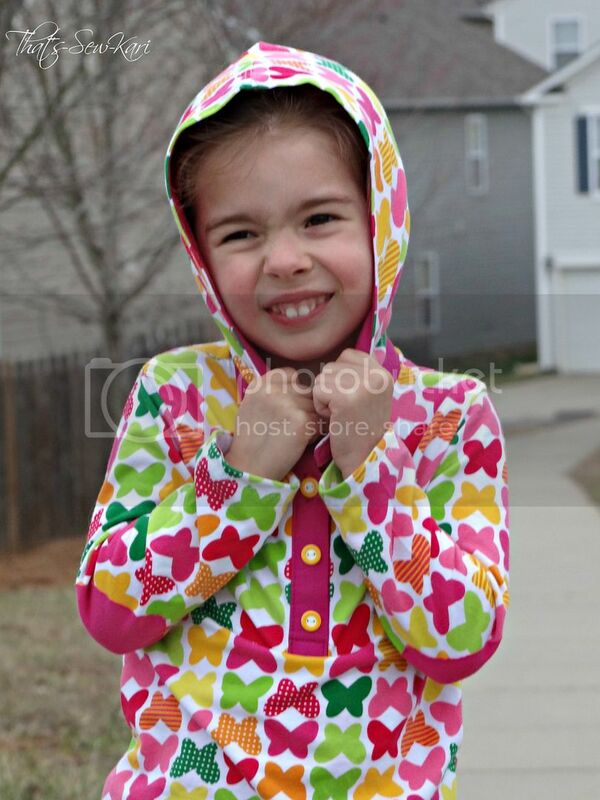 She likes to dress more for comfort and practicality so the hooded version is definitely more her style. 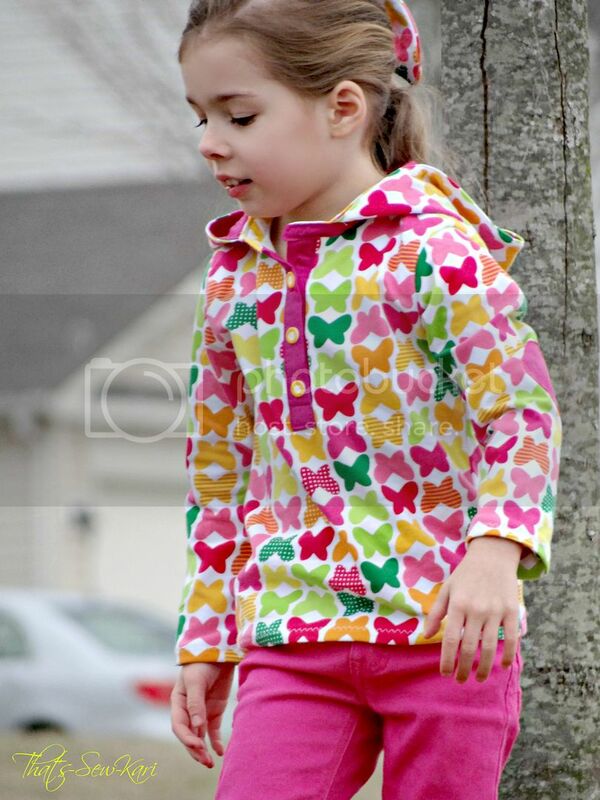 She loves the color pink though, and fell in love with this cute butterfly knit from One Red Blossom Fabrics. 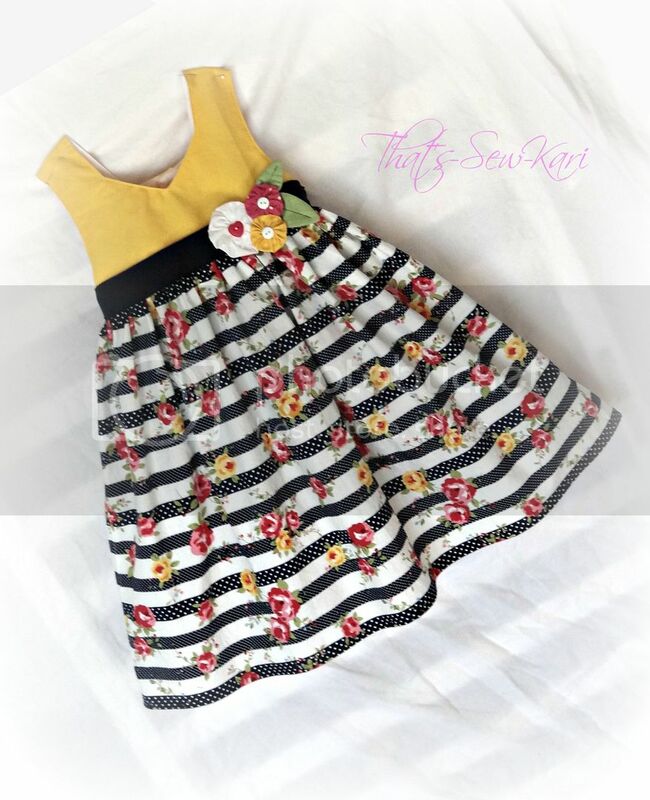 It's such a bright and cheerful knit, sure to be perfect for the upcoming spring. This version, I chose to use a bit more woven fabric than my other one. I did the placket, both collar stands, hood lining and back inset all in woven - a mixture of solid pink and a bright yellow chevron. 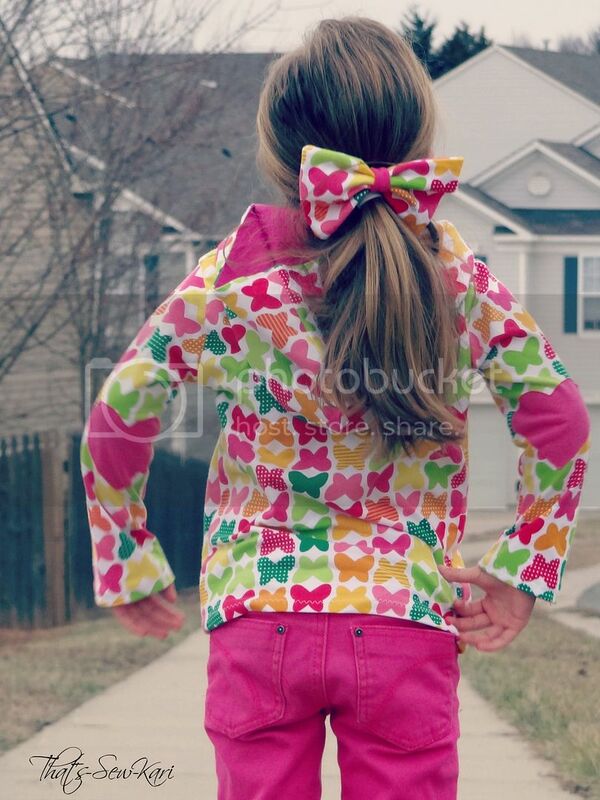 I finished it off with heart shaped elbow patches, a heart applique under the hood, and bright yellow buttons. 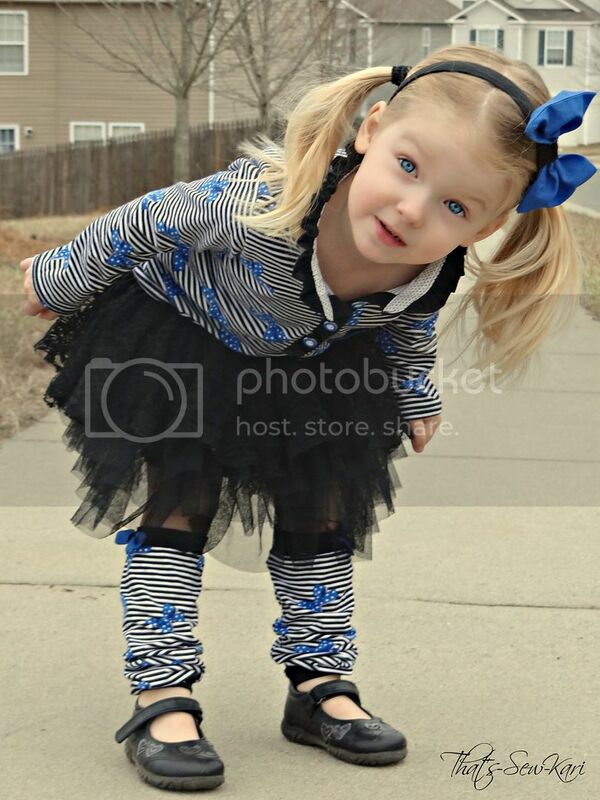 I paired it with hot pink skinny jeans (also compliments of Santa), a bow from scraps for her hair and some sporty water shoes to complete the look. 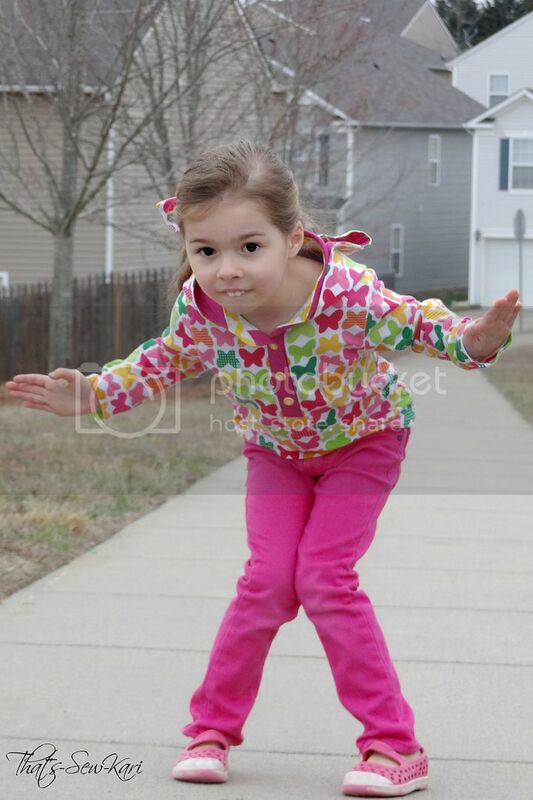 This is her Mission Impossible pose. So there you have it! Two different Soda Pop Polos for two very different personalities. I've only shown two versions of this pattern and there are so many more! 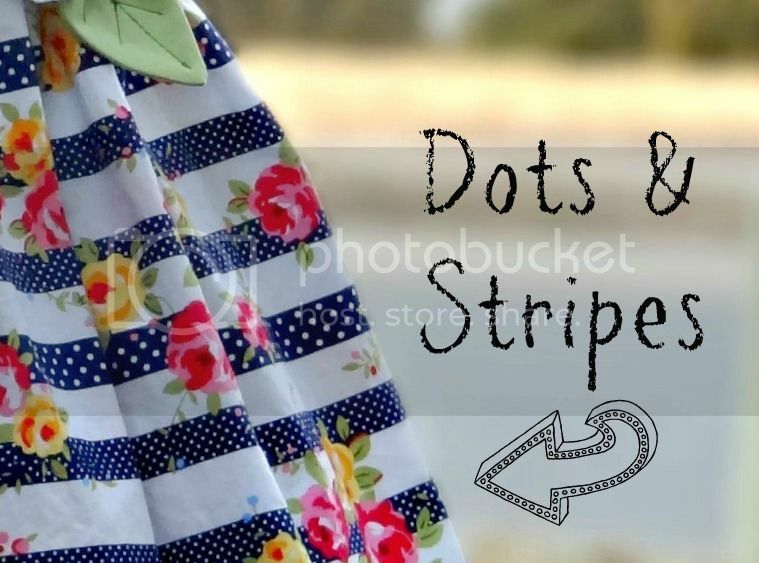 This pattern can be dressed up or dressed down depending on fabrics, collar type, and extra details; it's ALL up to you! Cutting charts for straight cuts given in both imperial (inches) and metric (centimeters) [where necessary]. Visit Candy Castle Patterns and browse her Pattern Shop and while you're there, take a gander at the awesome European fabrics available in her Fabric Shop! Use the code SODAPOP at checkout to purchase the pattern for just $7.50 (through 2/6/14 11:59pm MST).... now, go get your SODA POP on!! 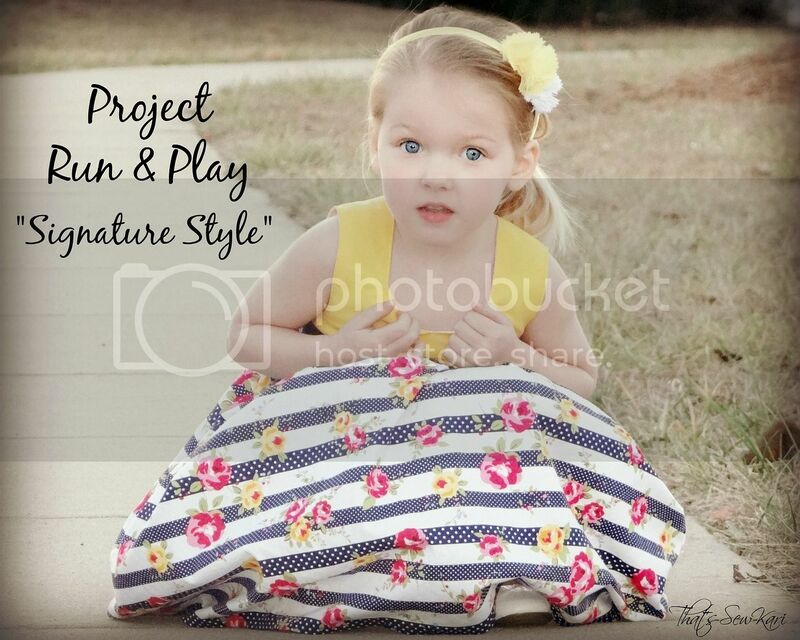 I'm so excited to share my final entry to Project Run & Play with you today! I decided to sit last week out because my upcycle project is a BIG surprise for someone and I didn't want to ruin the moment for her. (I will blog about it afterwards for sure, though!) This week's theme is "Signature Style" and for me, it was rather easy to come up with something represents my style. While I enjoy sewing the occasional "over-the-top" outfit, the patterns I am most drawn to have simple, clean lines, offering classic silhouettes -- letting the fabric speak for itself. And, if you've followed my work over the last year, at all, you'll notice that I often treat patterns as a blank slate for me to sew my own masterpiece. This project is no exception. I chose to use Candy Castle Patterns' Candy Castle Princess Dress as my base (no surprise there..haha). 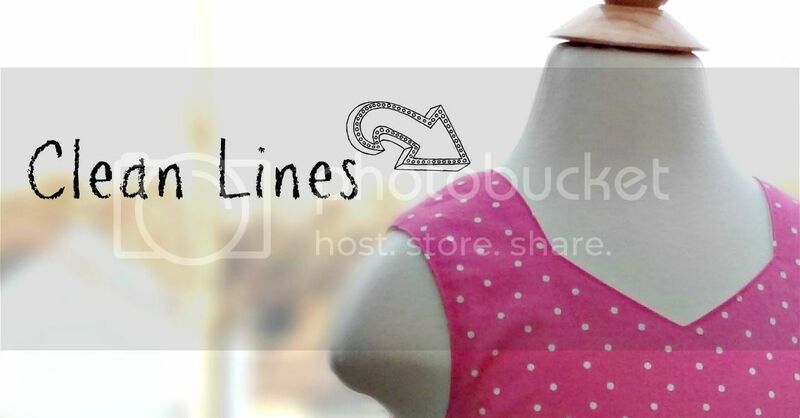 One of the things I love about this pattern is its beautiful neckline - it's a sharp Princess-cut neckline. I've made three (prior to these two) that were "Princessed" to the max. I really wanted to take it down to the bare bones and show off its classic beauty. By eliminating the top-skirt, it's perfect to showcase a beautiful print. 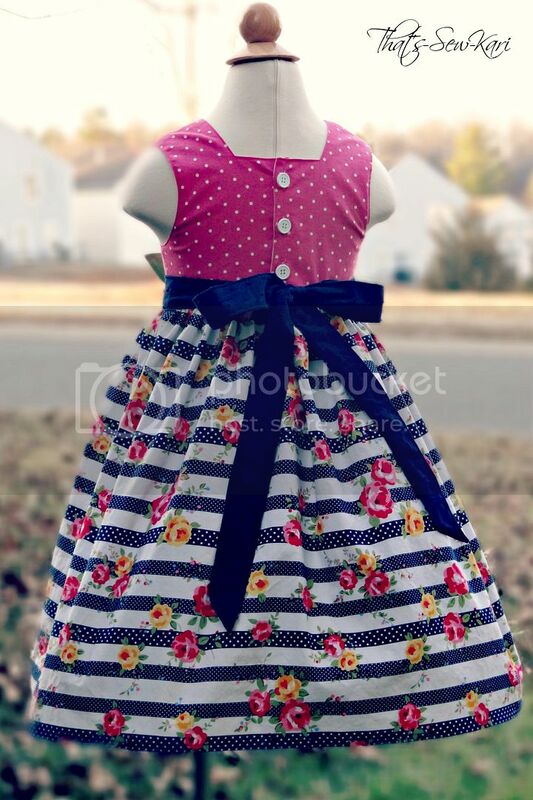 I've also switched out the wider, pleated sash from the pattern for the thinner sash from the Peppermint Swirl Dress, also by Candy Castle Patterns. Especially for spring, I love the color navy. Add in a pop of yellow and a bit of pink and suddenly it's not so dreary outside (okay, who am I kidding, it's rarely dreary here in the South during winter, but hey, I'm originally a Midwesterner). 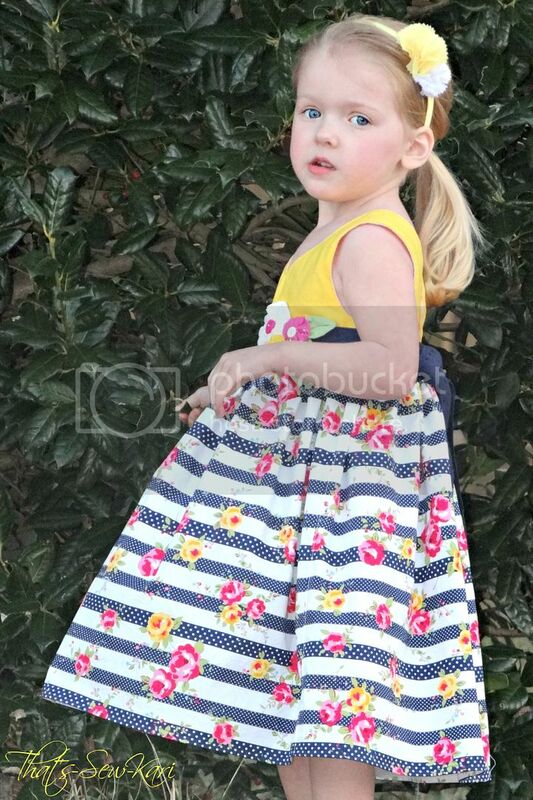 So colors in mind, and pattern printed, I set out to capture my style in fabric -- all the while, completing my Easter sewing two months early! Now, that's DEFINITELY my style! I'm always drawn to more geometric-type prints -- stripes, dots, repeating patterns -- basically, anything that can pacify my need for symmetry. I much prefer prints with specific patterns rather than randomness. 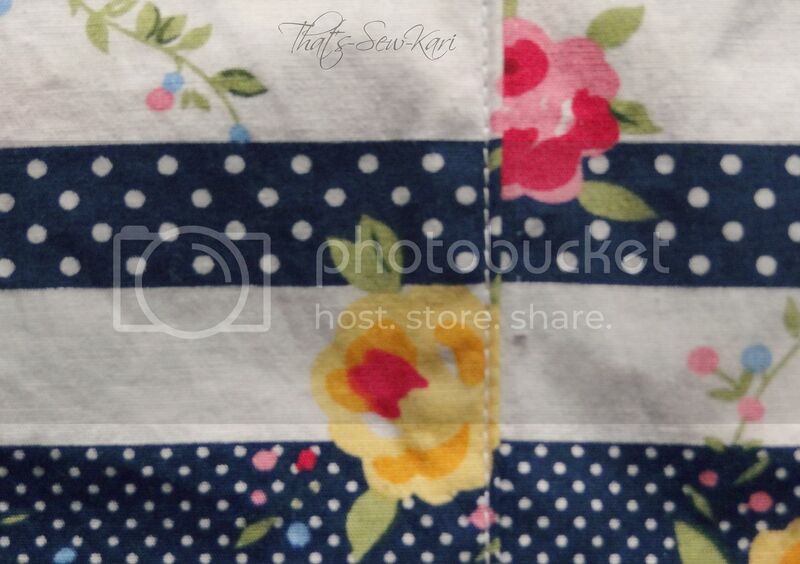 I came across this navy/white striped fabric with dots. With the addition of the colorful flowers, it was perfect for my project. In fact, it may have jumped into my cart... twice! 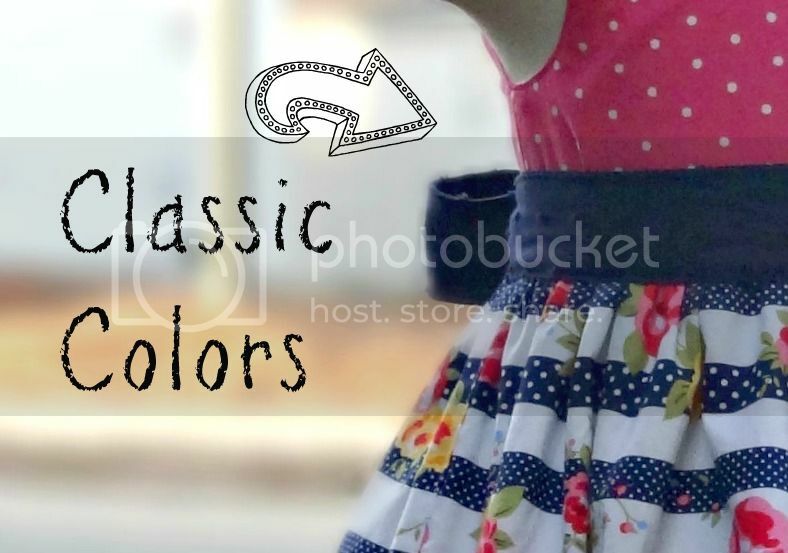 The polka-dotted pink fabric, solid yellow, and navy Swiss dot were all random pieces in my stash. While I sew, my mind often wanders -- thinking of any details I can add to make it .. well. more "me". Because of this, I take longer to complete my projects, but when I do, I love how they've turned out. 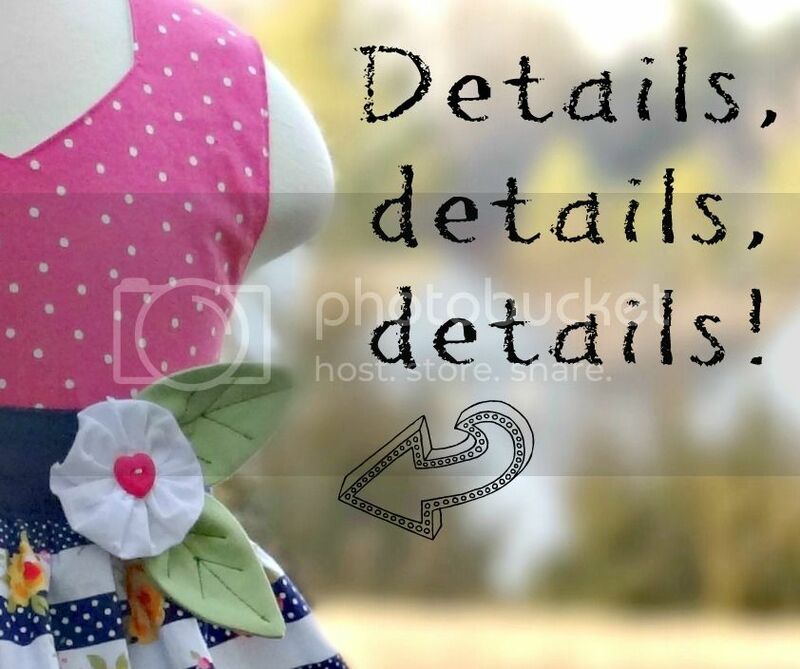 I've been known to rip out many a stitch if my top-stitch went awry; I keep trying ways to make my idea work (I'm stubborn like that); or I'm whipping up some fabric flowers or bows to add that little something extra -- the icing on the cake. See these flowers? Yep, a product of a wandering mind. They are part of the Candy Castle Princess pattern, but I had previously only used the bows in the pattern. I thought they would add that extra little detail I was missing on the sash. Cute, right?! Of course, details are more than just added flowers or bows. 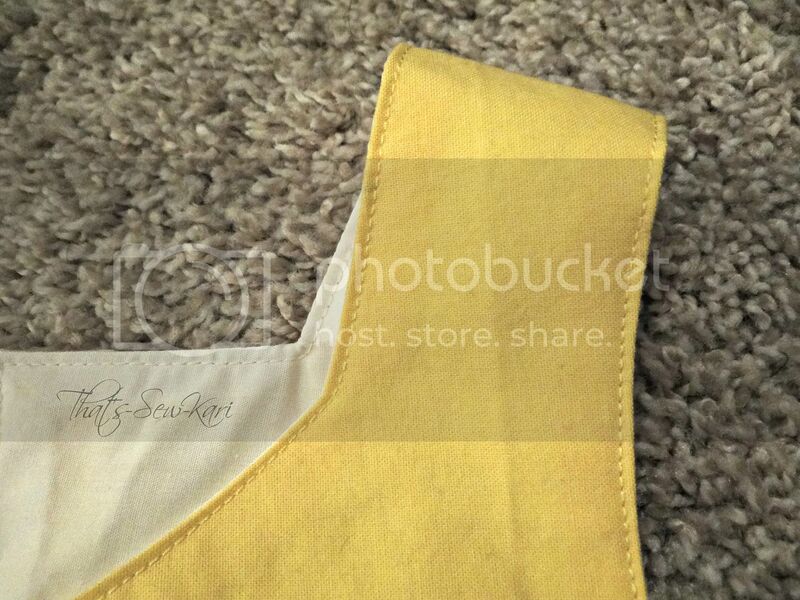 It's also about lining up your print of your fabric with your pattern pieces to figure out the best placement. 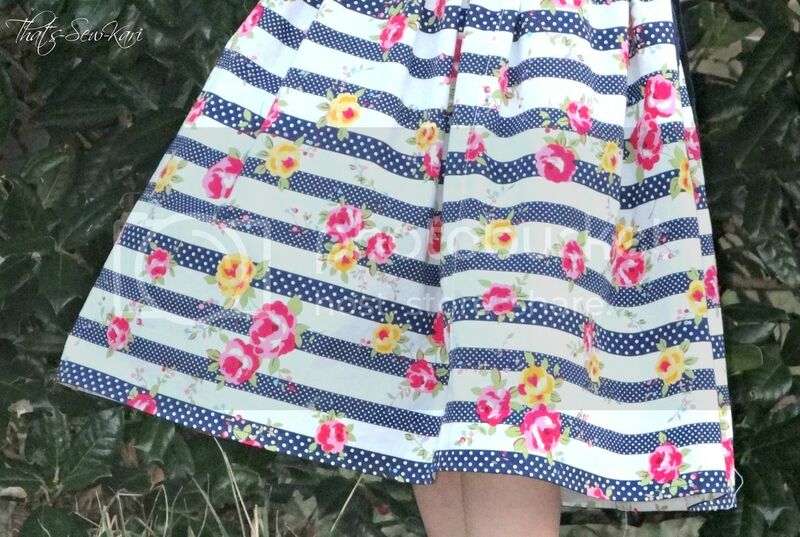 For example, I knew I wanted a navy stripe at the very bottom of the skirt. When I was cutting my skirt pieces, I added in the seam allowance under the bottom of the stripe so I knew exactly where to cut. It's so worth taking the extra few minutes and really thinking through all of the possibilities of print placement. If I have choices, I take a picture. Then I study the pictures and decide which I like best. And we can't forget top-stitching! This is one detail that I sew super slowly. Nothing is worse than ripping out a whole line of top-stitching gone wayward. And, there you have it! I think I've captured my style perfectly in these two dresses... and who knows, Mama might be getting a new dress too (of course, not nearly as tiny as theirs)!! Of course, I'd be remiss if I failed to show the back of this classic beauty, right? 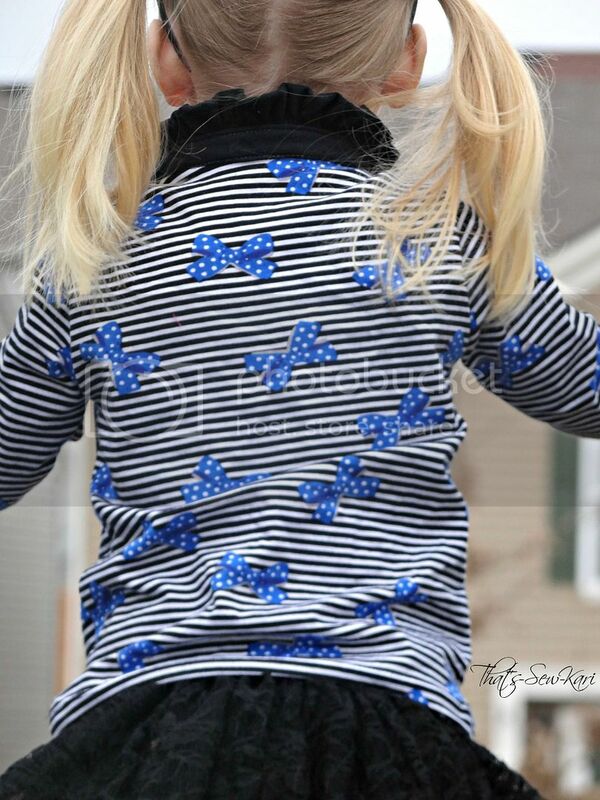 The back is just as pretty as the front -- its squared top and row of buttons are perfectly paired with a big bow. 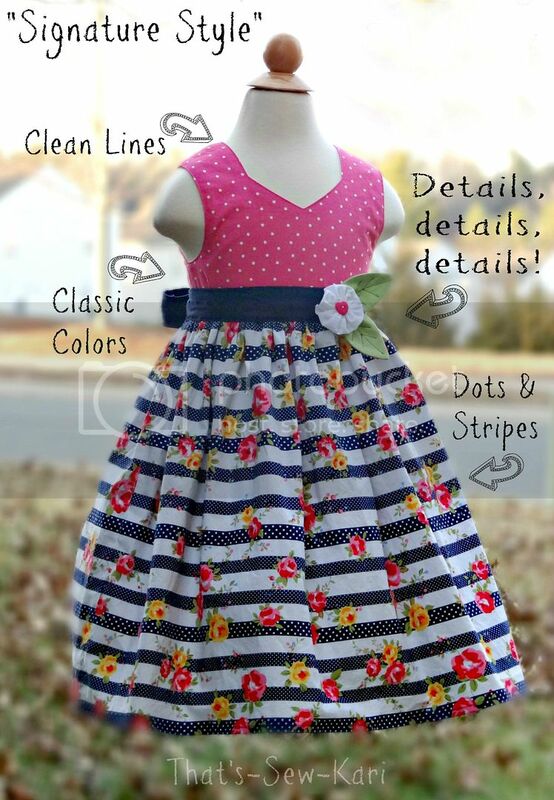 Remember the Sew-A-Long in the Candy Castle Patterns Group? These two dresses are the final result. I'm all for dual purpose sewing -- or is it triple purpose in this case?